After a much better days fishing in all of the camps I went up to Middle Varzuga for dinner. It takes just under an hour to get there by boat and in cold and wet conditions it can feel a long way but last night was the perfect night to go up – cloudless skies and very warm. The team at Middle were all in good spirits and many of them have been coming for countless seasons. 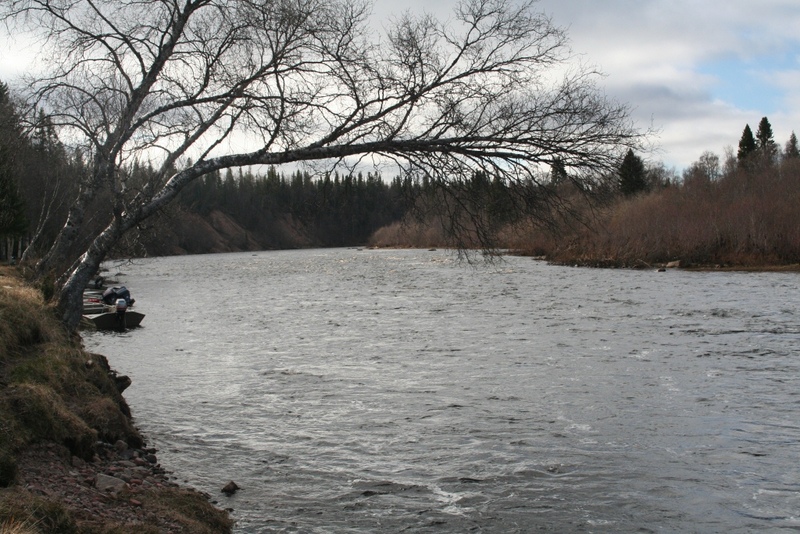 The common theme was that not many of them had seen the river this low at this time of the year before and they were all enjoying fishing different parts of the beat than normal. 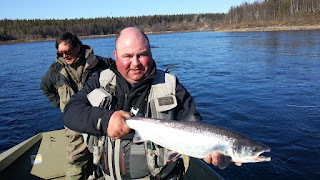 They landed 88 salmon yesterday but it is hard to pick out any one rod as everyone had caught roughly the same numbers and had all done well. They reported that when you found fish you could land 2 or 3 in the same place but that you had to keep moving in order to find them which is exactly the advice I would give to anyone coming here. 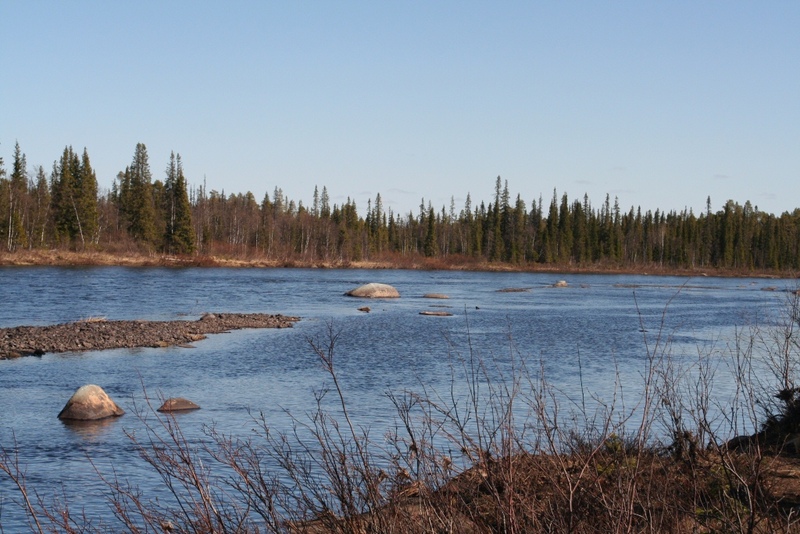 You should fish quickly and locate the holding spots. Kitza had their best day of the season so far and finished with 58 in the book. 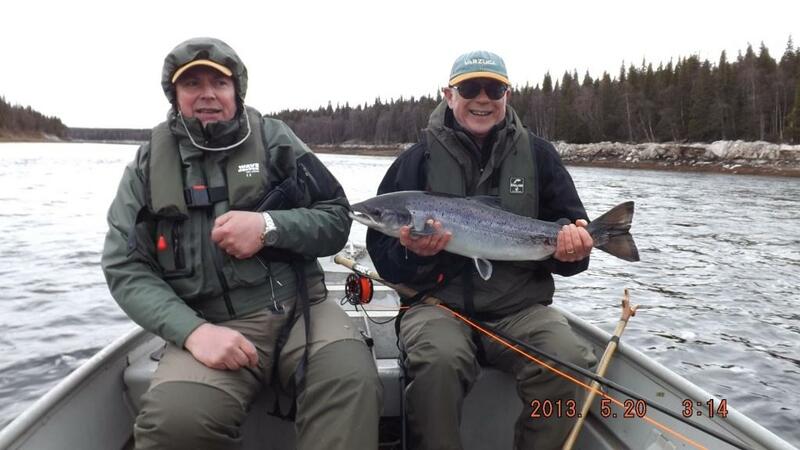 Ed M had 9 for his day and Hugh N had a really good fish of around 14-15lbs out of Reel pool. Tom was rushed this morning as several clients were out early in the morning and were grabbing a very quick breakfast before heading out again – the last day of the week tends to have that effect. Here at Lower we ended with 66 fish recorded with lots lost as well. 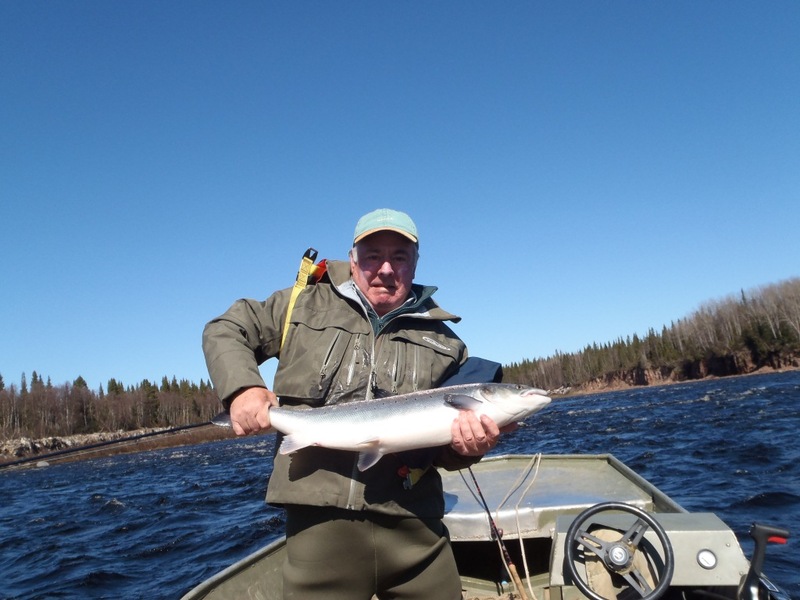 John M had 12 fish to his rod whilst his brother Kenny broke his own personal record by landing 6. 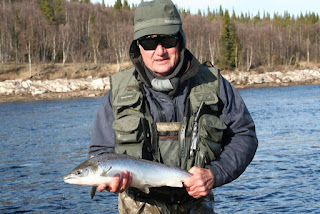 The beat was producing fish from the top at Wires to the bottom at Morskoy Island and at the end of the afternoon session it was great to sit in the sun and have a cold beer after an action packed day. The last day of the week always comes too quickly but we have some longed for cloud cover this morning and hopefully we will finish on a high. 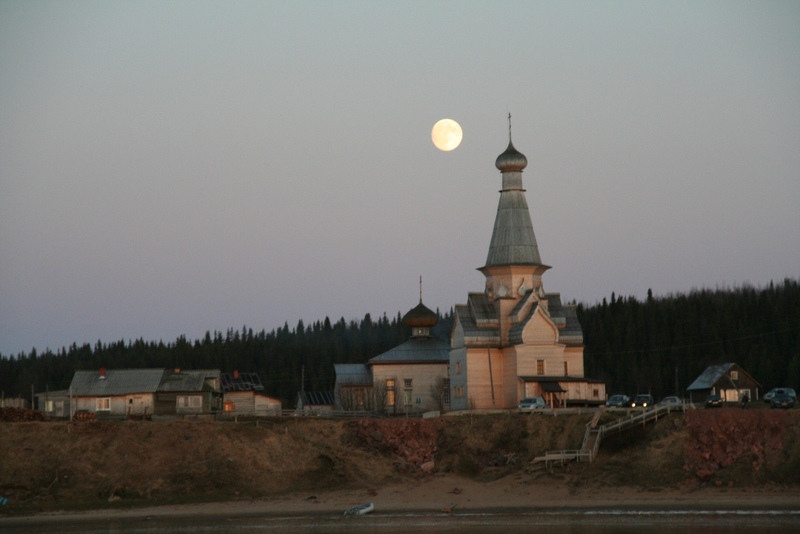 We will leave for Murmansk early in the morning so the next blog update will be on Sunday. Yesterday we flew up to Pana to help the new camp manager and cook set up the camp. It was great to see Tolli looking so well and the camp looks in good order. The new showers and plumbing are very smart and all 5 boats were in the water just waiting for someone to need them. 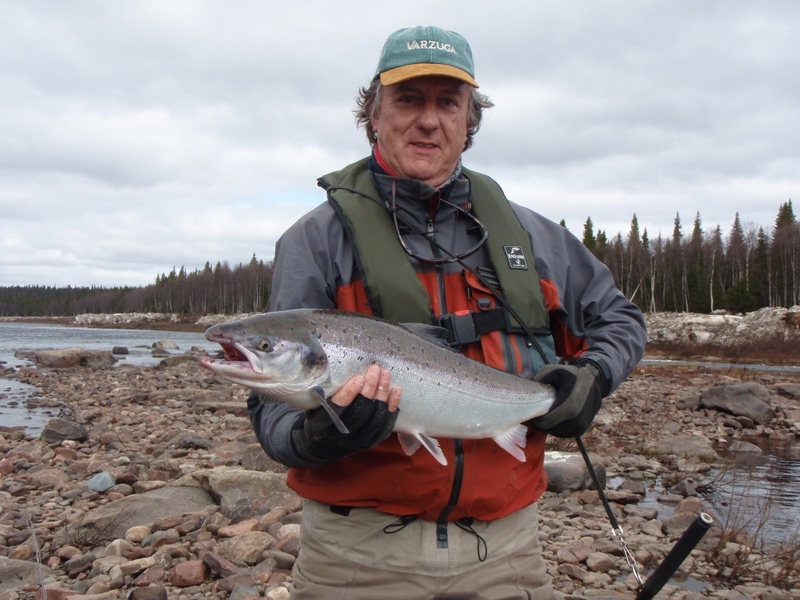 The water is quite low for this time of the year and Hippo Rock was well out the water but encouragingly, as we were moving kit into camp, we saw a few fresh fish showing just off the bank – it took all of our will power to focus on setting up the camp and not our rods. I flew back into camp just as dinner was about to start and it was clear that some rods had done very well but others had struggled. 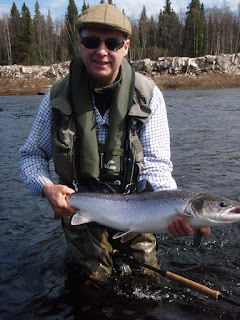 On catching up with Hugh and Tom this morning, it would appear that everyone had a tougher days fishing yesterday but as Christopher wrote last week, tough is a relative term on the Varzuga. We finished with exactly 50 fish in the book with Joe L accounting for 7 of them and he lost another 7 as well. Greig T and Alan M continue to be a fishing partnership to be reckoned with and they were both out this morning before breakfast where Greig had 4 and Alan added another to his growing total. John M also landed 4 fish this morning to set the day up nicely. 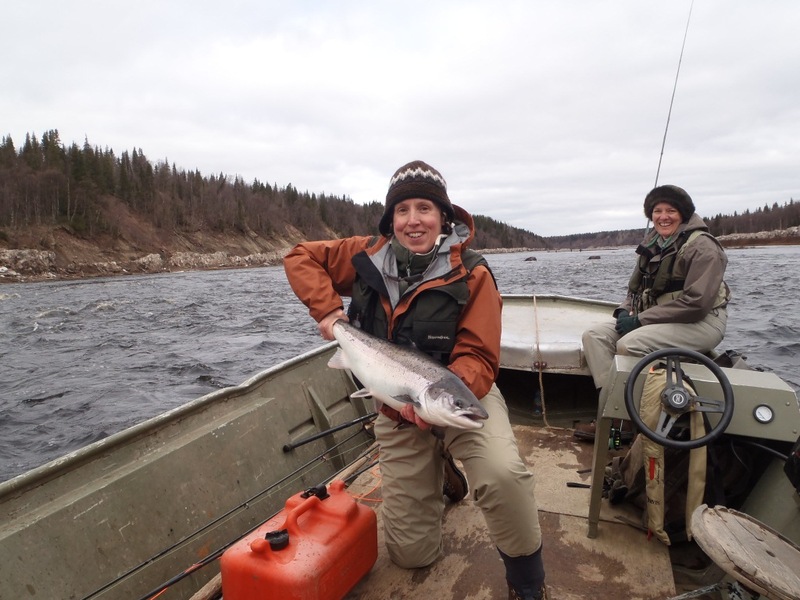 Kitza had 30 salmon for the day with Caleb S taking top rod honours by landing 10 of them. Tom said that they had a difficult morning but the afternoon session was much better with many more fish showing throughout the beat. Middle recorded 79 with John R taking 10 of those. 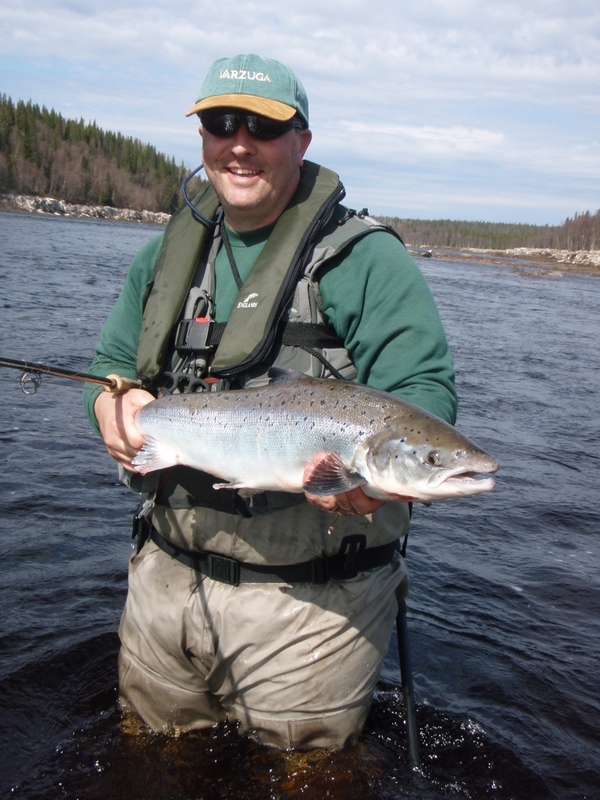 He also had a cracking fish of around 16lbs from Simmons which was measured at 34 inches. 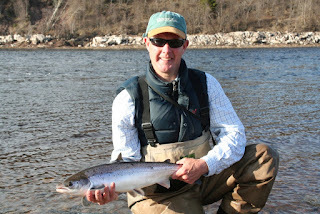 Martin L had 7 for his day and there were some early risers this morning out on Generator and Bear. 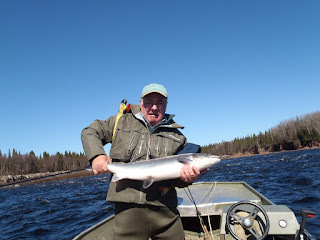 It is a beautiful but very hot day today – the water is creeping up to 10 degrees and we are beginning to arm ourselves with floating lines - everyone was scurrying around after breakfast looking for Sunray Shadows and Collie Dogs and I hope we will see the first fish caught on a skated fly before too long. 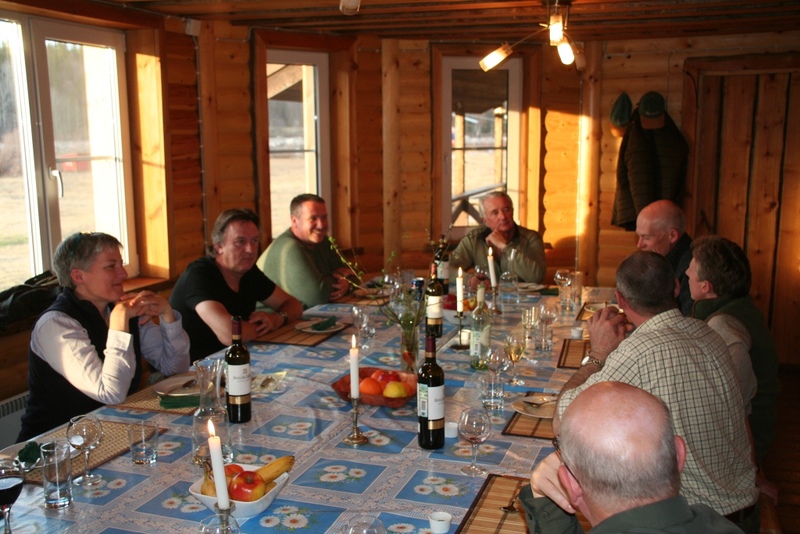 After a very good days fishing here at Lower we flew over to Kitza to do the mid week changeover. As ever, it was good to see Kitza and to hear the many happy tales of fish lost and landed from the team who are now in camp with us. 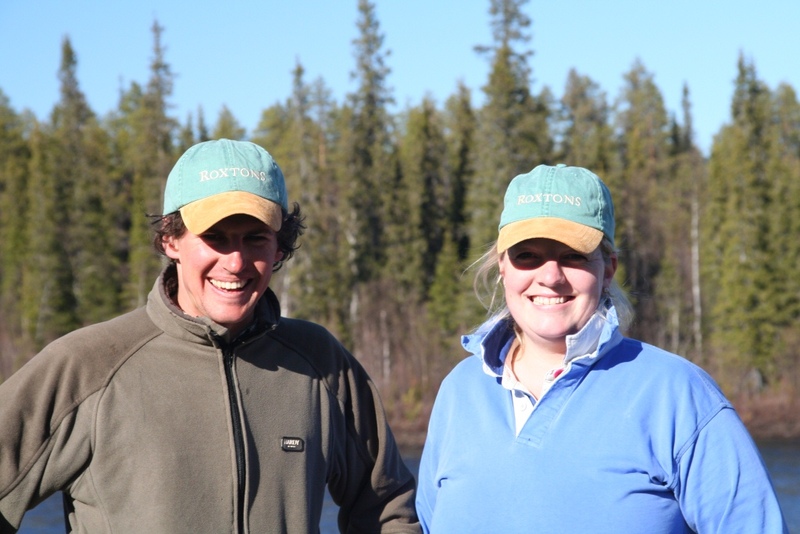 Michael E and his team, who started their week at Lower, finished with 255 fish for their 3 days fishing – an excellent total and everyone left here in great spirits, excited to be going over to Kitza where the fish are really starting to build in numbers. The team that we picked up had a great days fishing yesterday and landed 40 fish between them with Joe L taking a really chunky fish from Sasha’s. As we had hoped, they reported seeing a lot of fish moving through the bottom of the beat and everybody remarked on the strength of these fresh fish. Not wanting to waste any time at all, we had a quick dinner and some of the rods went straight out again with Alan M being the star performer taking 4 fish in quick succession from the Wires. 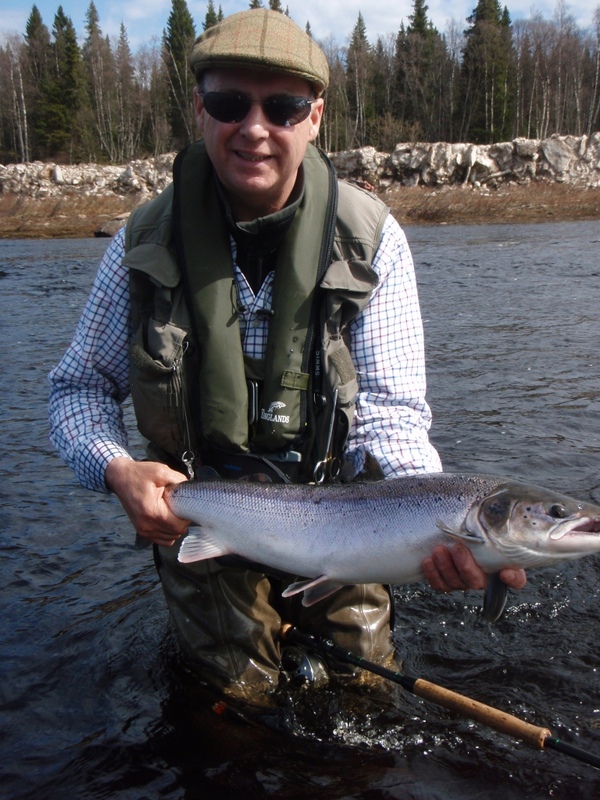 Demonstrating admirable stamina, Alan was out before breakfast this morning and had a further 4 fish from Heli pool to show everyone what the river was capable of producing. It is a very cold morning but everyone was out at the boats at exactly 9am in order to make the most of their time here. We are still fishing sink tips and intermediate lines with 1 inch tubes but with the water temperature creeping up to 9 degrees this morning, I expect us to be on floating lines and size 6 flies before too long. 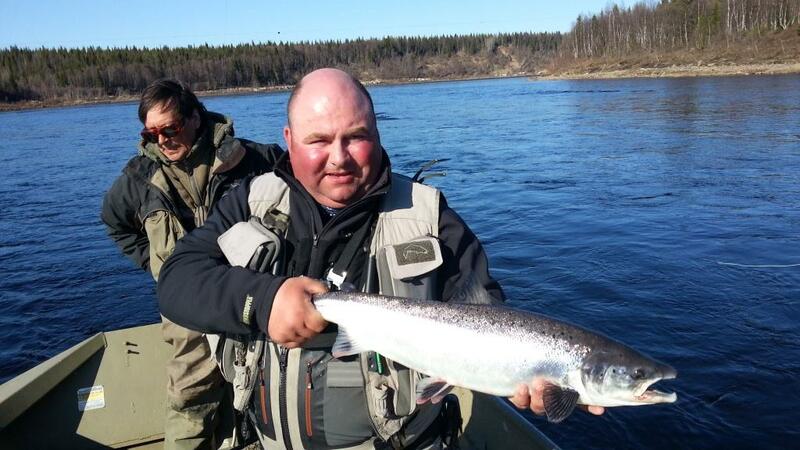 At Middle Varzuga the 12 rods landed 89 salmon yesterday with Paddy F landing 9 fish in his afternoon session. For the first time this week, the higher beats offered some excellent fishing and Hugh, the manager at Middle, is keen to get more rods up there today – it is a stunning part of the river and when the fish are there in numbers it is hard to beat. Today we are flying the 80 miles to Pana to take Damian and Charlotte up there to open up the camp before their first guests arrive on Saturday. I will take some pictures of the river and I expect to see Hippo Rock well out of the water. 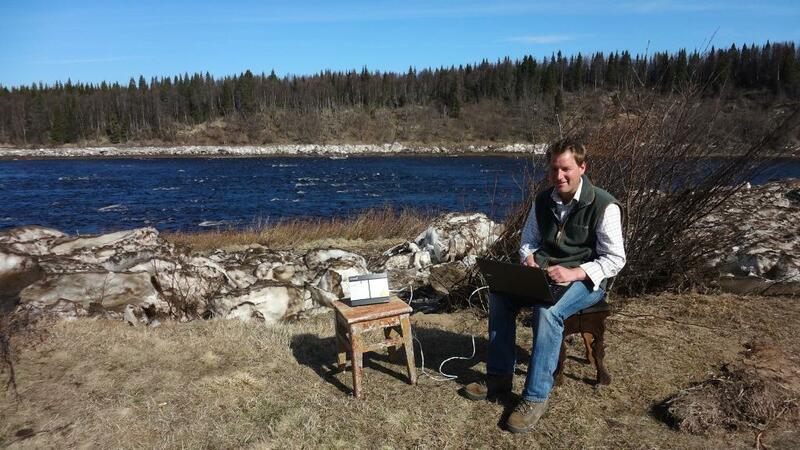 Yesterday was one to confound all theories about salmon fishing. Sue C started proceedings by landing 5 fish out of Heli pool before breakfast - at that time the air temperature was considerably colder than the water. We then had barometric pressure that was up and down like a yoyo with a really cold morning followed by a searingly hot afternoon – none of which affected the fishing in the slightest. 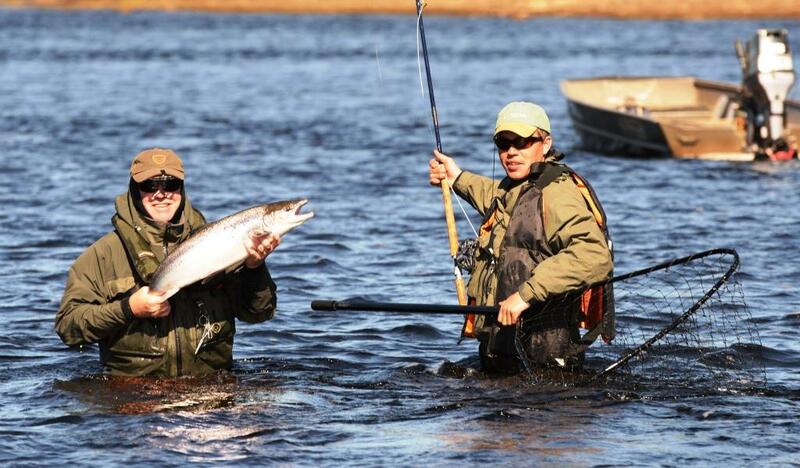 We finished our day at Lower Varzuga with 79 salmon landed to the 10 rods with everyone doing well. Graham M, Hugh N and Sue C all landed more fish in a day than ever before and everyone reported that they had seen, hooked, lost and landed some really decent fish. 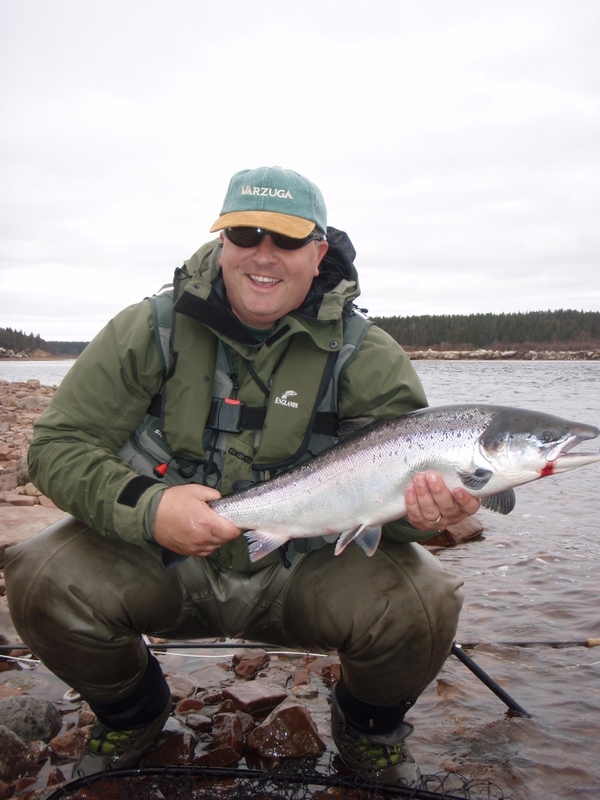 The fish we are seeing are really well conditioned and John M landed one on Beach yesterday morning which he simply described as “salmon perfection”. Kitza recorded 32 fish for the day with David B taking the honours in the morning by landing 5 fish from Third Island and Goldmine. Encouragingly, Alan M was fishing Sasha’s in the afternoon and took 4 salmon, straight off the tide, in fairly short order and Tom reported seeing lots of fish running through the beat. 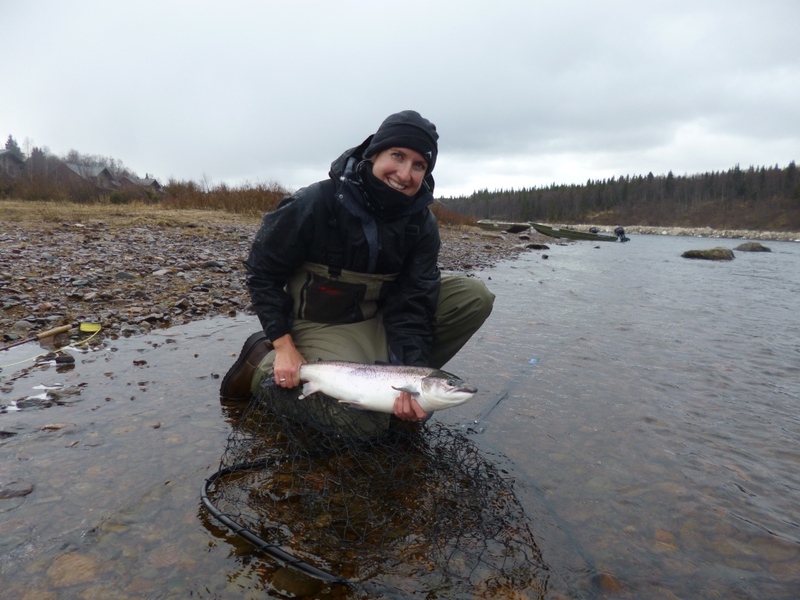 Despite low water and a big flood, the main run of fish is bang on time. I spoke to Tom at an earlier than agreed radio time as he arranged a flotilla of boats to take everyone down to the White Sea for a barbecue dinner. 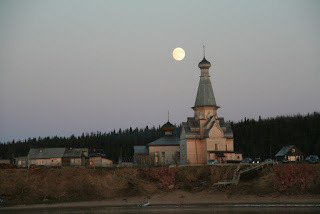 There are very few places more atmospheric than down there and he reported that everyone had felt that there was something special about being “at the end of the world”. The 12 rods at Middle Varuzga landed 95 for their day with scores evenly spread across the board. It remains the case that the beats nearer the camp are the most productive but every beat is producing fish. 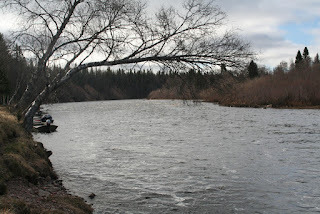 The water is dropping quite quickly and many of the fish are running the middle of the river which does mean that those who can cast a good and straight line will be the most rewarded. It is a grey day this morning but all are determined to make the most of their final day at Lower and the boats left at 9 o’clock sharp. Tonight we will take our clients over to Kitza and bring those rods back here for the mid week changeover and I will try and get some pictures of the river for those of you coming later in the season. 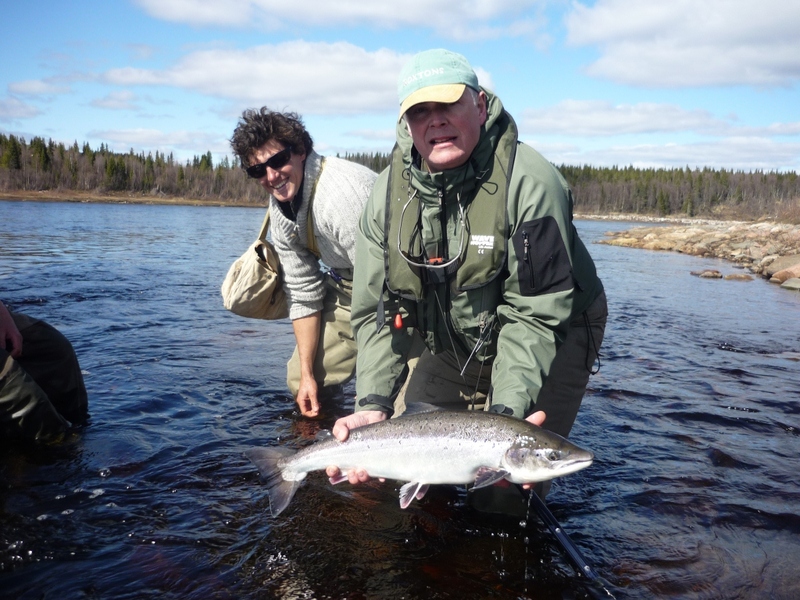 The second week of the season has started in style with all of the camps reporting some great fishing. Being based at Lower Varzuga, it is inevitable that we hear more first hand accounts of battles won and lost here than we do about the other camps but it was clear that both Hugh and Tom had plenty to tell me and it was highly encouraging to hear their enthusiasm despite a rather crackly radio last night. At Lower, many of the experienced rods broke their own personal records with Eric W landing 11 in his morning session at Bear Corner whilst Ed M finished with 14 fish for the day. Caleb S was not keen on coming back into dinner and who can blame him as he capped off a brilliant session by landing his 21st fish of the day. 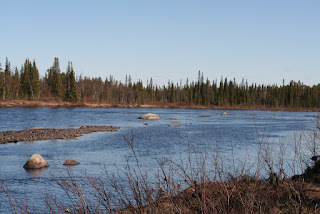 ﻿Over dinner there were many tales of fish lost when firmly hooked which was backed up by Michael E, who has been here countless times and knows the beats intimately, who recounted how he had lost 8 fish in a row on Bear Corner before landing one. We concluded that it was entirely possible that the 10 rods had had encounters with well over 200 fish yesterday with 107 of those actually landed – a great day in every respect. As regular blog readers will know, getting definite figures from Middle Varzuga is practically impossible as at nearly every hour of the day, at least 1 or 2 rods will be fishing but Hugh said his best estimate was that they were up to around 135 in the book since the team landed on Saturday evening. 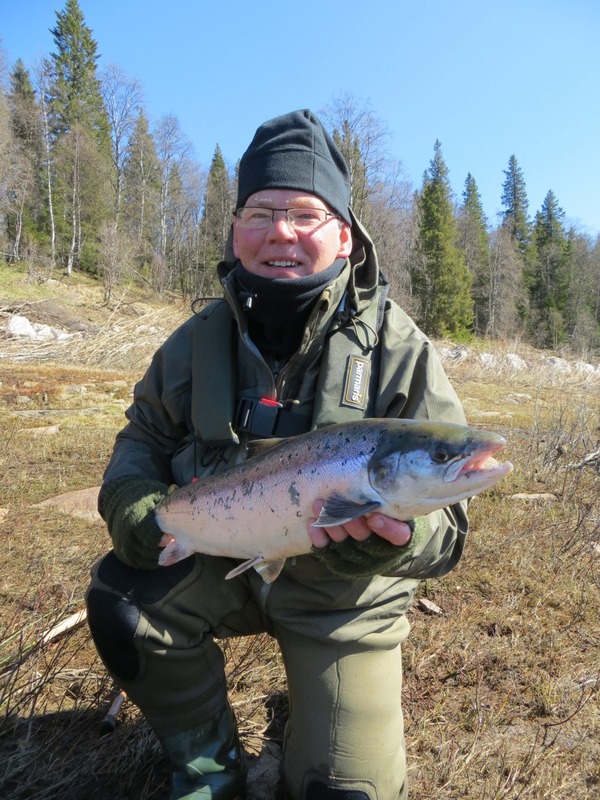 They most productive fishing is still below Clarks but every day more and more fish are being landed in the higher beats. The day at Kitza was a tale of two halves. They concentrated on the normally productive lower beats in the morning but very little was caught below Sasha’s which is strange for this time of the year. At lunch they decided to head upstream and immediately started finding fish. Understandably the team are keen to go up there today and it will be interesting to see how they get on. 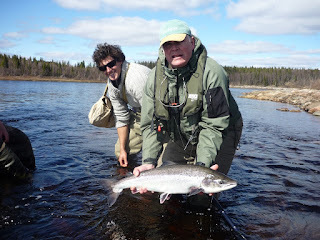 They landed 35 for their day with Alan M taking a cracking fish from Gold Mine. ﻿It is cold this morning with a biting wind but Sue C landed 5 fish before breakfast from Heli and the weather has not dampened anyone’s enthusiasm. The water temperature is at 8 degrees and dropped only an inch overnight; we are hopeful of a similar day to yesterday.